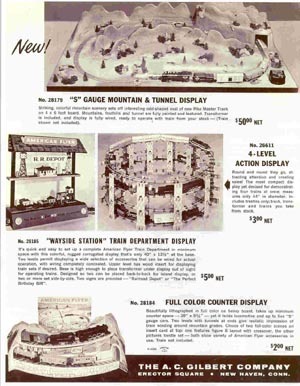 1961 American Flyer Retail Displays Flyer (D2255). Mint Condition. - $5.00 : Olson Hobbies, Welcome To The Train Page! 1961 American Flyer Retail Displays Flyer (D2255). 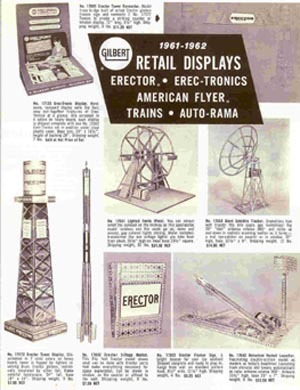 D2255 Gilbert, American Flyer 1961-1962 Promotional showing Retail Displays for Erector, American Flyer Trains, Erec-Tronics, and Auto-Rama. Displays show Erector on the first page. The middle pages show American Flyer Retail Train Displays, with the 28235 World of Transportation, 28230 S Gauge Display Connected Double Oval, 37016, HO Two Train Display, the 20706 Bubble Pack and the train display with the set contents of the 20705 train set. The back page shows other Dealer assorted promotional items. This was put out by the A. C. Gilbert Co. to promote dealer sales. Size is a 8 1/2 X 11 inch, 4 page, gray, black-and-white copy from an original in my collection. It was reproduced on heavy bond white paper.